When we talk about online marketing, the picture is quiet the same between an ecommerce site and personal blogs. For attaining long term results, you will require putting some substantial efforts and try to make your site stand out from the crowd. In this article few easy tactics are explored which you can adopt directly on your sites, and build more traffic overtime. Marketing with social media As the craze of social networking is growing day by day, the rise of facebook and other social sites like hubpages and squidoo, gives rise to multiple marketing channels. With the viral collision with social media, you can influence the traffic volume exponentially. One of the most important techniques you can put into practice is to set up your facebook fanpage to let your followers spread your site. 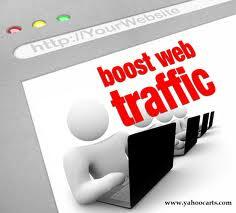 If you want traffic immediately, than buying the traffic will be the best way for you. There are a lot of choices when it comes to pay-per-click advertising. Google Adwords and Facebook Advertising are some accepted choices for marketers. This process needs a huge investment to be done before witnessing any results through advertising. Basically the big companies have almost unlimited budget to invest on these PPC networks. In addition, you need to pay particular attention on your landing page as well as the keywords research. They all make up for a successful campaign. There are surely more ways to encourage your ecommerce site. Here we have covered general ideas on how you can get started with internet marketing. And don’t forget, actions are the vital keys to succeed online.